DR. SAMUEL MCCLELLAN was the tenth child and seventh son of Hugh McClellan and his wife, Sarah Wilson. He was born in Colerain, Mass., on the 1st day of June, 1787. His grandfather, Michael McClellan, came to this country some forty years earlier, in 1749, and settled in Colerain. The son, Hugh, was born shortly before his immigration. The maiden name of Hugh's mother was Jane Henry, a kindred of John V. Henry, a distinguished lawyer of Albany, early in this century. Hugh McClellan was a captain in the war which resulted in the separation of this country from England. The troops under his command were called minute-men. His company was with the army of Gen. Gates sometime before the capture of Burgoyne, and was employed in scouting. While so acting they captured a similar party from Burgoyne's army, which was said to be returning with information of a practical line of retreat. The muster-rolls of the company are still on file in Boston. Thereafter Capt. McClellan was promoted to the colonelcy of his regiment, which office he held at the time of Shay's rebellion. He continued to represent his town in the General Court of Massachusetts until he declined to serve longer. But ancestral honors do not count largely in this country in making up the individual account-current of the chapter of life's doings in the short pilgrimage allotted to man in this Republic. This holds especially true of the life of a doctor. It is given to him to do good to others, and only from the overflow of that goodness to garner wealth and honors to himself. The duties of his professional life require him to be a student in the strict sense of that term. He has first to learn the structure and complicated offices of the human body in its perfectly healthy state, and the laws of its healthy condition. Immediately in the track of that knowledge follows the science of pathology, whereon is founded the fundamental art of diagnosis. The objective aim of the last-named art is to ascertain and unfold the diseases to which the human body is subject, and distinguish them from each other. The physician enjoys a twofold mode of studying the science of bis profession. He has first the teachings of those medical writers who have made record of their observations and experience, and then he has his own observations, whence he gleans from nature herself. In the one branch of study he learns what others have thought; in the other he learns how to think himself. Thus, as he grows in in years of study and practice, he may grow skilled in the art of diagnosis. Therein lies the field where the old doctor has the opportunity to excel the young one, and where the wise man excels the fool. Hence is taught the general truth that the doctor must learn not only the laws of health and the abnormal ways of disease, but he must learn to think, for thinking is an art to be learned, and none the less an art incidental to every special calling followed by man. In this field of knowledge, embraced within the art of diagnosis, Dr. McClellan excelled and his excellence therein was the chief source of his success. His skill in the art of diagnosis grew with his experience, until his sagacity in that field of observation seemed almost intuition. It was not difficult to trace that excellence in his professional character to its fundamental elements. In the first place, he was conscious that nature had dealt out to him the faculties necessary to the profession he had selected with no niggardly hand. There was nothing left for him in do except to cultivate and exercise those faculties. He had the industry to cultivate, and moral courage to exercise, his faculties, and hence they bore their legitimate fruit. His talents were never hidden under a bushel in obedience to the society rules of the medical order to which he belonged. He never submitted to regulations which interdicted social or professional relations with others because they belonged to another school of practice. It was a common remark of his that he learned something from all the schools, and he regarded it a duty to appropriate all that was good from whatever source derived. He never refused to counsel because the attending physician belonged to a different school of practice from his. He represented a large pattern of manhood physically, morally, and intellectually, which could not be forced within the narrow rules of a bigot. While he met the duties of his profession as a physician and a surgeon, and shrank from nothing, he denied to his fellows the right to prescribe a standard of etiquette imposing upon him the obligations to be less than a man or a Christian because he was a doctor. That expanded feeling of humanity and liberality characterized his course as a doctor and a citizen. Dr. McClellan commenced practice in the town of Schodack in 1812, near the village of Nassau, about a mile from the place where he soon after removed, and where he thereafter always lived. He died in April, 1855. His wife survived him about ten years. Soon after he settled in Schodack, and before the end of the year, that section of the State was afflicted with an epidemic disease which prevailed very generally and extensively, and was of an unusually virulent and fatal type. It is now known as typhoid pneumonia, but was then comparatively unknown, and baffled the skill of the best practitioners. Dr. McClellan was pre-eminently successful in his treatment of the disease. It was his opportunity, and he established a practice immediately over a territory larger than is commonly allotted to one man's ride, and held that place during life. He thus commenced his practice as a physician, in his first, year, in the front rank of his profession, and always maintained his place. His professional day had no morning, but began at mid-day. In another particular Dr. McClellan's professional career was notable. He was in the front rank of his profession in every department as a physician and a surgeon. He was counsel when diseases of a difficult and malignant character supervened, and he also performed the difficult surgical operations. That was the place conquered by his own merits the first year of his practice, and he held it unabated for forty years. In consequence he became the peer in professional accomplishments of any physician in the State. 1. Laura Cook, who married the Hon. Anson Bingham, and they reside on the homestead at Schodack (Nassau village). 2. Mary Elizabeth, who married Parris Barber, of Homer, N. Y., where she died, leaving two children. 3. 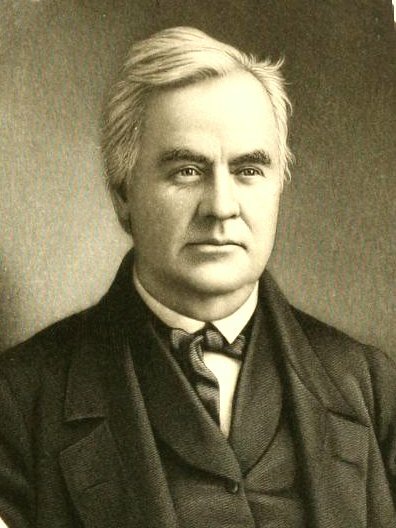 Hugh Wilson, who married Eunice F. Marvin, and resides at Chatham, N. Y., and is the present county judge of Columbia County (See sketch of H. W. McClellan in this work). 4. Sarah Thankful, who married Hon. John T. Hogeboom, and resides at Ghent, N. Y. Mr. Hogeboom was former county judge of Columbia County. 5. Robert Henry, who married Jeannette E. Tobey, and resides at Troy, N. Y. (See sketch of R. H. McClellan in this work). 6. Harriet Eliza, who married Jacob B. Sibley, of Schodack, and who resides at Randall, Wis. They were all worthy of such a father, and gained places in society for themselves. Dr. McClellan was particularly accomplished and fitted to social relations. To a commanding personal presence he joined a persuasive address, uniform and pleasing. The equality and liberality which characterized his professional conduct distinguished his personal character in his associates with his fellow-men generally. His address was uniform, and recognized no social distinctions depending upon wealth or position. It was remarkable in one respect: while it was so open and pleasing as to invite rather than repel conversation, it was so commanding as to restrain familiarities. Again, fully conscious of his own powers, he was a consistent, humble Christian, with a full belief in Divine revelation. He, with his wife, united with the Presbyterian Church of Nassau in 1821; but, in 1840, after the separation of the church into old and new school branches, they removed to the Reformed (Dutch) Church. He found his highest happiness in his Christian faith, which was fully expressed in his life. Dr. McClellan never sought political honors, but be was a delegate to the Whig National Convention, at Baltimore, in 1844, which nominated Henry Clay for President. He was supervisor of his town in 1845, and a member of Assembly from Rensselaer County in 1846. After a life of industry, usefulness, and honor, the memory of no eminent and wise citizen is more reverently and affectionately cherished by the people of the hills and valleys of Rensselaer and Columbia than that of Dr. Samuel McClellan.